Of these, the first three were the principal original division. This meant “the triple sacred science.” The Rigveda is the older work of the three from. Samaveda and Atharvaveda were borrowed from Rigveda while Yajus was an independent work consisting of sorcery and speculative mantras. 3. Saman, which are in meter, and intended for singing at the Soma ceremonies. 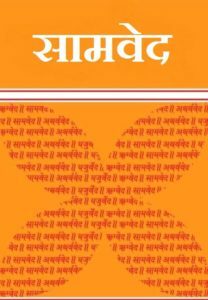 The Yajurveda, Samaveda, and Atharvaveda are independent collections of mantras and hymns. They are intended as manuals for the Adhvaryu, Udgatrand Brahman priests respectively. The Atharvaveda is the fourth Veda. Its status has occasionally been ambiguous, probably due to its use in sorcery and healing. However, it contains very old materials in early Vedic language. Manusmrti often speaks of the three Vedas. In fact, it also referred to them was called Trayam-Brahma-Sanatana, “the triple eternal Veda”. The Atharvaveda like the Rigveda is a collection of original incantations, and other materials borrowing relatively little from the Rigveda. It has no direct relation to the solemn Srauta sacrifices. However, the mostly silent Brahman priest observes the procedures and uses Atharvaveda mantras to ‘heal’ it when mistakes have been made. Its recitation also produces long life, cures diseases, or effects the ruin of enemies. The Rigveda Samhita is the oldest Indian text. It is a collection of 1,028 Vedic Sanskrit hymns and 10,600 verses in all. These all are organized into ten books. The hymns are dedicated to Rigvedic deities. The books were composed by poets from different priestly groups over a period of several centuries. This work was commonly dated to the period of roughly the second half of the 2nd millennium BCE which was the early Vedic period in the Sapta Sindhu region of Punjab of the Indian subcontinent. 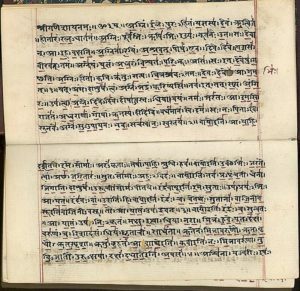 The Yajurveda Samhita consists of ancient prose mantras and also in part of verses borrowed and adapted from the Rigveda. Its purpose was practical. In that, each mantra must accompany an action in sacrifice. However, unlike the Samaveda, it was compiled in order to be made applicable for all the sacrificial rites, and not only the Somayajna. 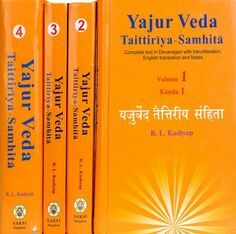 While White Yajurveda separates the Samhita from its Brahmana (the Shatapatha Brahmana), the Black Yajurveda combines the Samhita with Brahmana commentary. The Samaveda Samhita consists of 1549 stanzas. Apart from the 78 stanzas, rest almost everything was taken from the Rigveda. Like the Rigvedic stanzas in the Yajurveda, the Samans have been changed and adapted for use in singing. Some of the Rigvedic verses are repeated more than once. Including repetitions, there are a total of 1875 verses numbered in the Samaveda recension. Two major recensions remain today, the Kauthuma or the Ranayaniya and the Jaiminiya. Its purpose was liturgical, as the repertoire of the “singer” priests who took part in the sacrifice. The Atharvaveda Samhita is the text ‘belonging to the Atharvan and Angirasa poets. It has 760 hymns, and about 160 of the hymns are in common with the Rigveda. Most of the verses are metrical, but some sections are in the form of prose. It was compiled around 900 BCE. However, some of its material may go back to the time of the Rigveda. Some parts of the Atharva-Veda are older than the Rig-Veda though not in linguistic form. The Atharvaveda is preserved in two recensions. They were the Paippalada and Saunaka. The Paippalada text exists in a Kashmir and an Orissa version. It is longer than the Saunaka and is only partially printed in its two versions and remains largely non translated. As compared to the other three Vedas, the Atharvanaveda has less connection with sacrifice. Its first part consists chiefly of spells and incantations. These are concerned with protection against demons and disaster, spells for the healing of diseases, for long life and for various desires or aims in life. The second part of the text contains speculative and philosophical hymns. The Atharvaveda is concerned with the material world or world of man. It is thus in this respect that it differs from the other three Vedas. Atharvaveda also sanctions the use of force in particular circumstances. This point again is a departure from the three other Vedas. Brahmanas – The spiritual notions surrounding the concept of the one “Veda” that would flower in Vedantic philosophy have their roots already in Brahmana literature, for example in the Shatapatha Brahmana. Vedan – The contemporary traditions continued to maintain Vedic ritualism. 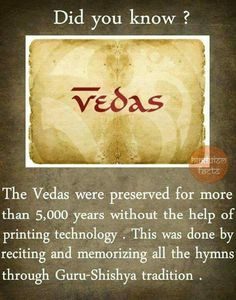 But it was Vedanta which renounced all ritualism and radically re-interpreted the notion of “Veda” in purely philosophical terms. Besides the four main Vedas, there was something also called as ‘Parisista.’ Parisista meant “supplement or appendix” and was the term applied to various ancillary works of Vedic literature. These works dealt mainly with details of ritual and elaborations of the texts logically and chronologically prior to them: the Samhitas, Brahmanas, Aranyakas, and Sutras. Naturally classified with the Veda to which each pertains. Parisista works exist for each of the four Vedas. However, only the literature associated with the Atharvaveda is extensive. The study of the Vedas was found curious not only by the Indian scholars and historians but also to the western world. In the early 19th century, Arthur Schopenhauer drew attention to Vedic texts, specifically the Upanishads. The importance of Vedic Sanskrit for Indo-European studies was also recognized in the early 19th century. English translations of the Samhitas were published in the later 19th century, in the Sacred Books of the East series. This work was edited by Muller between 1879 and 1910. Apart from this, Ralph T. H. Griffith also presented English translations of the four Samhitas, published from 1889 to 1899.